Fusion Dessert Ideas To Jazz-Up Your Indian Wedding Catering! Here are three reason why you should have FUSION desserts at your wedding! They give you a new experience in terms of flavour and texture. They are unique. Most such combinations your wedding guests will be trying for the first time! The desserts themselves will make your guests differentiate your wedding from the rest and remember this unique delight. So, here are some ideas that you can discuss with your caterer to have on your wedding day! This is a fusion desert that combines basic Indian carrot pudding with a ghee cake! The first step is to make the Gajar ka Halwa which will be the main ingredient, followed by the cake itself. Make sure that you are making a ghee cake with it, otherwise the flavor will not shine through. For all you Gajar ka Halwa lovers, catch your favourite dish in a new avatar! Want a fast and easy way to use fusion deserts to flaunt your dessert table on your wedding? Go for these sneaky budget halwa ladoos for quike dessert pop ideas. Add coconut shavings for flavor and to add unique taste to the ladoos. Say ‘hi’, to portion control! Ladoos get hotter this season. Use coconut and pistachio to have an exotic and rich fusion dessert for the wedding. Pudding and shondesh combine to form a Bengali fusion dessert. Shondesh for the new generation! Want to give it a try? It’s an easy-bake cupcake with the perfume and flavor of Gulkhand. They are quick and account easy. They are not the easiest cupcakes to make but, the effort pays off in the taste and the reactions from your guests! 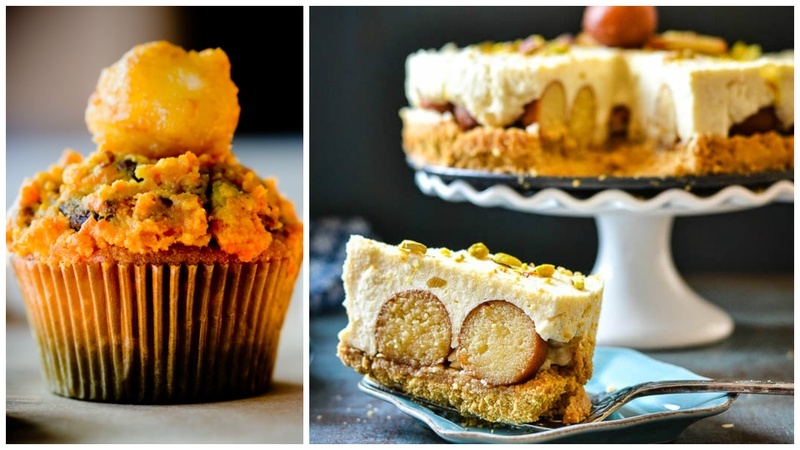 They require you to make the carrot halwa and gulab jamun before you can make the cupcake batter. So only indulge in this fusion Indian dessert if you can pull through with time and funds! And yes they exist! Overindulgence got a new name! These amazing desserts will not be the leftover from your wedding. Get stocked. Rose milk, gulkhand mixed with soaked basil leaves gives you this unique fusion dessert! Add toppings as you please. Paan flavours really come through in a kulfi. Try it and see for yourself! How about pairing up your favorite international dessert with a touch of desi! Creativity is in full flow when it comes to the dessert table of Indian wedding celebrations! So, why leave one of our favorite popular traditions out of it? Yes none other than the paan is a strong flavor use in the new experimental fusion dessert market! Subtle white chocolate and bold chai come together to create these must-make cupcakes. It can also be called Carrot Halwa Roulade. This india-inspired dessert is simple carrot pudding, stuffed between sheets of sweetened mawa and rolled like a swiss roll for effect! It’s a fun makeover to the Halwa classic. Add a drizzle of Rabri on top for and even bigger impact taste and presentation-wise! Garnish with chopped nuts of your choice.